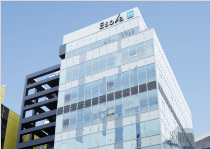 A variety of new types of convenient, user-friendly commercial facilities are being developed in stations for our customers such as Echika, Echika fit and Metro pia, as well as other buildings directly connected to the stations such as Esola Ikebukuro. 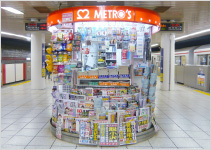 There are also METRO'S kiosks, automatic vending machines, coin lockers and ATMs on the station premises. In addition, we are promoting the introduction of PASMO electronic money in the above commercial facilities and kiosks, and are also issuing credit cards equipped with PASMO functions. "Echika" is a commercial facility developed in stations aiming to integrate railway facility and commercial establishment. It creates an attractive station space in harmony with the neighboring city. 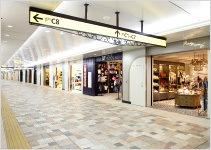 Developed at Omote-sando and Ikebukuro stations. "Echika fit" is the smaller version of Echika. The main concept of "Echika" is "E" (good) "chika" (underground). 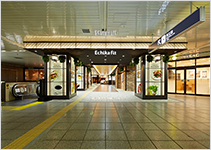 Echika fit aims to "fit" into our customers’ lifestyles, the area and the current trends under the catch phrase "Chotto ii, choudo ii, chika no machi" (or "A good and perfectly-sized underground shopping area"). "Echika fit" can be found at Tokyo, Ginza, Nagatacho stations. There are two types of To Me CARDs. The first is a To Me CARD which functions only as a credit card, and the second is a To Me CARD PASMO which combines the functionality of a To Me CARD and a PASMO card in a single card. It is possible to accumulate two kinds of points; Metro Points which is a point service for Tokyo Metro, and credit card company points. 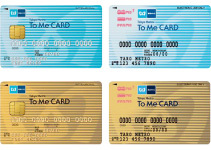 Additionally, accumulated points can be charged to the PASMO card and special services can be received when using the card at participating retailers.